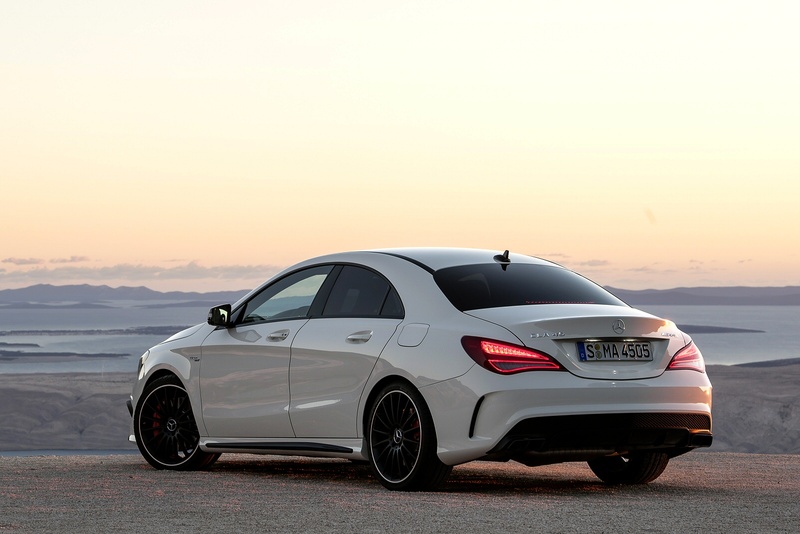 Handsome, efficient, capable and devastatingly rapid thanks to all-wheel drive and a 381bhp power output, the Mercedes-AMG CLA 45 Coupe offers the proper AMG package condensed into a more compact four-door coupe or Shooting Brake estate shape. It does look fairly expensive though. 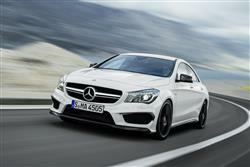 AMG, the go-faster division of Mercedes-Benz, has changed. Not so very long ago, it was a company that developed Mercedes models into autobahn destroyers with huge power outputs but very little in the way of poise or subtlety. The first signs that AMG was developing more rounded sported cars came with the introduction of the facelifted E 55 AMG in 2003 and was cemented by the amazing C 63 AMG in 2008. Yes, there have been a few clunkers along the way such as the R 63 AMG and the SLK 55 AMG Black Series, but by and large AMG had turned itself around. Few would have predicted that AMG would be selling a compact four-wheel drive, 2.0-litre model built on the chassis of a Mercedes A-Class and that it would be entirely credible, yet that's exactly what we have in the rather handsome shape of the CLA 45. It's good to know that the products from Affalterbach have never been in better shape. The most powerful series-production four-cylinder engine in the world? Step right up. 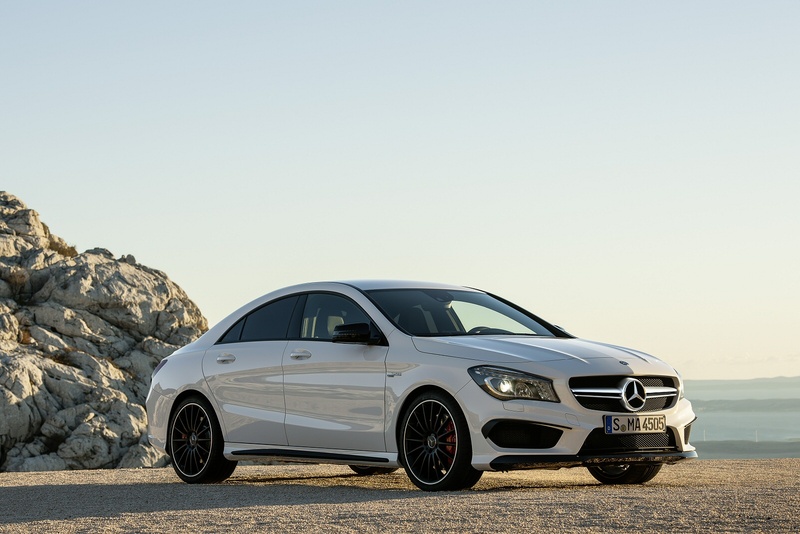 Naturally, putting that amount of power to the tarmac through the four wheels of a Mercedes-Benz CLA makes for some impressive performance figures. 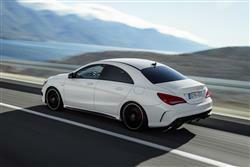 Mercedes claims a sprint to 62mph in just 4.2 seconds before running onto an electronically limited top end of 155mph. You'll be able to replicate this if you like, thanks to the 'race start' launch control system. The AMG 4MATIC all-wheel drive system directs up to 50 per cent of torque to the rear wheel to ensure a playful bias to the car's handling and guarantees a rapid getaway. That 1991cc four-cylinder powerplant is a piece of work. Developing 475Nm of torque - more than a Porsche 911 Carrera S. There are now two radiators instead of one, a larger intercooler and variable-vane turbocharger are larger, the exhaust system is different and now features a loud mode. The suspension gets firmer springing, slightly softer dampers than its A45 AMG twin, and big anti-roll bars, and it's all finished off with reassuringly huge brakes, a wider track, and sticky tyres. The steering has also been revised with firmer bushings offering better feedback. The transmission is a seven-speed dual-clutch automatic which has been tweaked to offer quicker shift times and more aggressive automatic shift modes. The AMG 4MATIC all-wheel drive system directs up to 50 per cent of torque to the rear wheel to ensure a playful bias to the car's handling and guarantees a rapid getaway. The 62mph benchmark comes and goes in 4.2s on the way to an electronically limited 155mph maximum. 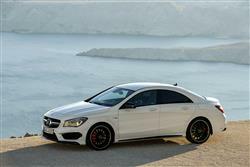 The CLA was already a good looking car but the AMG version ups the aggression by several notches. Eighteen inch alloys are fitted as standard with nineteen inch rims sure to be a popular option amongst those who don't mind sacrificing ride quality for style. There's a "twin blade" radiator grille and the cross strut in the front apron, both painted in matt titanium grey. The rear apron with its highlighted air outlet openings at the sides features a diffuser insert and trim in matt titanium grey. 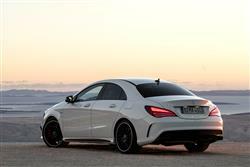 Two square, chrome-plated tailpipes of the sports exhaust system finish the rear end appropriately. Jump inside and you're bound to like the sports seats in Artico man-made leather and Dinamica microfibre. It's not some cheap pleather-alike. This feels like leather and is extremely hardwearing. 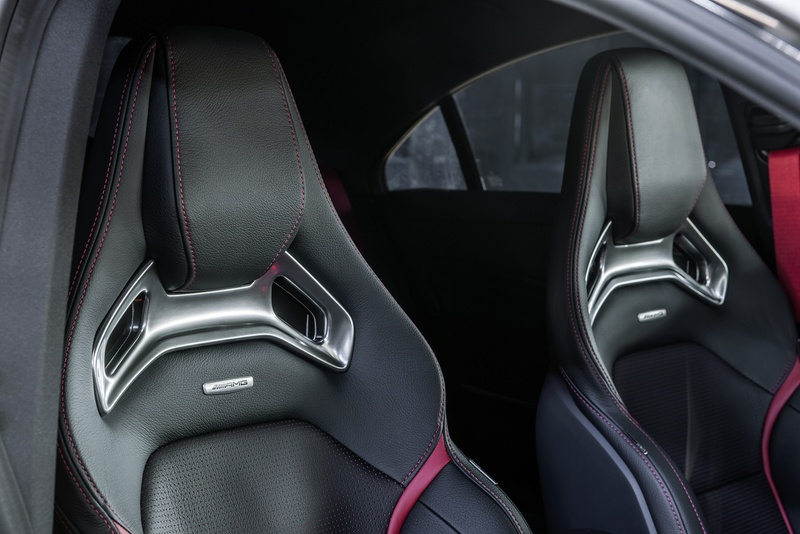 The seats are both supportive and comfortable and the amount of effort that's gone into the cabin is evident everywhere you look. The small AMG gear shifter is a neat touch, embossed with the Affalterbach company's logo. The instrument cluster presents information by means of a central colour display with a race timer mode. Out back, there's quite a high lip to lump your packages over, but once you do, there's a generous 470-litres on offer and a standard split-folding rear bench. 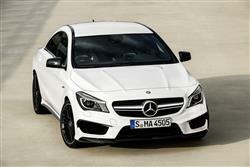 If that's not enough, talk to your dealer about the CLA-Class Shooting Brake estate. Now here's the potential sticking point. The RRP of this car is close to £45,000, around £4,000 more than the slightly racier A45 Mercedes-AMG model. Yes, in the four-door version, you do get a bigger boot when all the seats are in place (at 471 litres, there's fully 130 litres more than the A Class) but can the CLA really justify that price differential? More to the point, the BMW M140i, which isn't a whole lot slower in real world conditions is over £10,000 cheaper. That's a whole chunk of wedge but drive the two cars back to back and you'll see where the money's gone. It's been spent on a cleverer drive system, a gruntier engine, a classier interior and a whole other league of inbuilt superiority. Yes, the Mercedes genuinely does feel £10,000 more expensive. There's a choice of saloon or 'Shooting Brake' bodystyles and standard equipment includes a specially-tuned ESP stability control system with three modes; on, Sport Handling and Off. Jump onto the brakes in either of the latter modes and the full ESP protection kicks back in. There's also an additional function called ESP Curve Dynamic Assist nips the brakes on the inside rear wheel to increase agility through bends. It also gets a radar-based collision warning system . Working with adaptive Brake Assist, which lowers the risk of rear-end collisions, the Collision Prevention Assist system gives a visual and acoustic warning to alert a distracted driver to identified obstacles, and prepares Brake Assist for the most precise braking response possible. This is initiated as soon as the driver steps firmly on the brake pedal. It's all very clever but like the best technology, doesn't impose itself until it's actually needed. 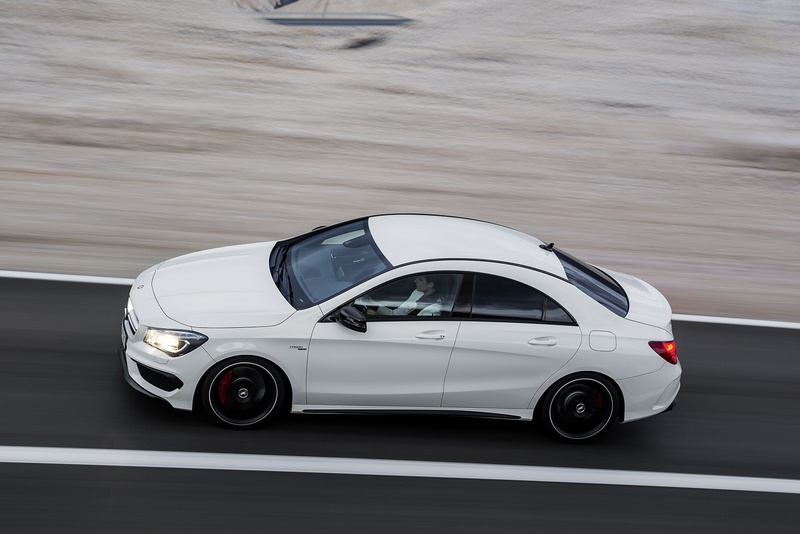 For all its astonishing performance figures, there was one fact about the CLA 45 that made me shake my head in disbelief and marvel at how quickly efficiency has improved. It's the fact that this car drinks less fuel and emits less carbon dioxide than a 150bhp Ford Fiesta ST of not so many years back. 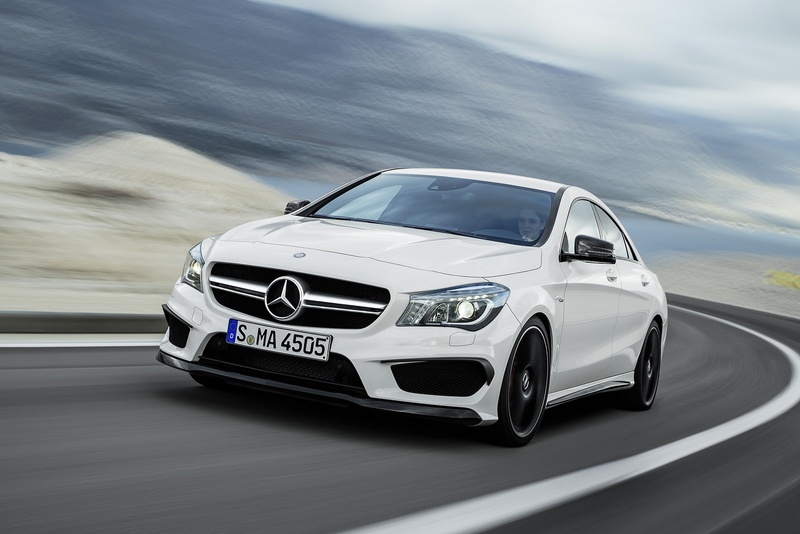 Mercedes claims a combined cycle fuel economy figure of 41.0mpg. Clearly this figure will head south if you use the throttle pedal as intended, but it's hard to argue with the 165g/km emissions figure. Of course, you will have to budget for some pretty hefty insurance premiums but that will be offset by what are predicted to be strong residual values. With all-wheel drive, tyre bills will also likely be slightly easier on the pocket too. 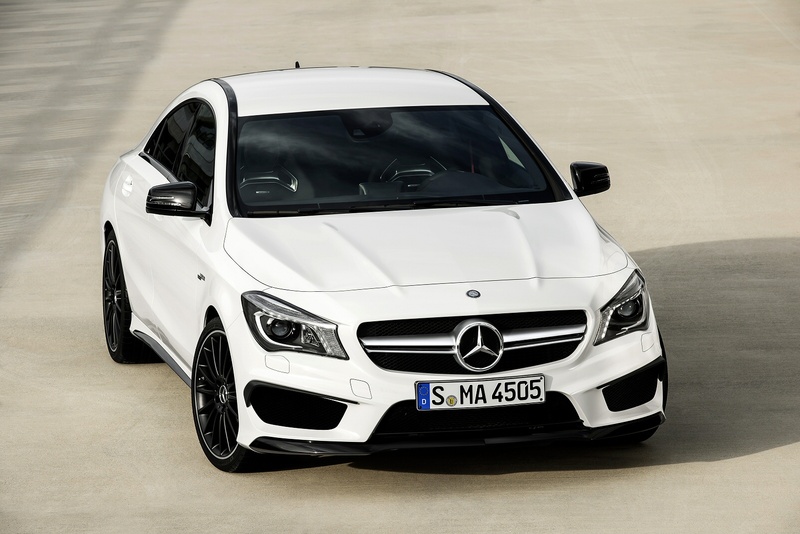 If you�re looking for a new Mercedes-AMG CLA 45 4Matic 4dr Tip Auto [Comand] Petrol Saloon for sale, you�ve come to the right place. At Bristol Street Motors we don�t just have the best Mercedes-AMG CLA 45 4Matic 4dr Tip Auto [Comand] Petrol Saloon deals, we also offer friendly advice and help with all your enquiries to ensure your buying experience is a happy experience.